I was really excited to see how big the brush was, as it reminded me of the one that comes with Dior Show, which is an excellent, but really expensive mascara. 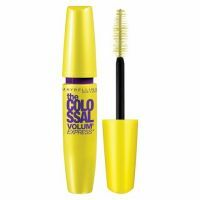 Unfortunately, this one had almost no effect on my lashes. I ended up taking the brush and using it in another mascara. Yeah it's volumizing but not colossal, it's good and cheap so really theirs nothing to complain about here.